KOMUNITAS: INTERNATIONAL JOURNAL OF INDONESIAN SOCIETY AND CULTURE (p-ISSN 2460-7312, e-ISSN 2460-7320) is nationally accredited by the Directorate of Higher Education Indonesia based on SK NO. 30/E/KPT/2018. Jurnal Komunitas is indexed by DOAJ, Google Scholar, JournalTOC,Ebsco and every article is given a unique DOI. Though Jurnal Komunitas is full English journal starting from its Vol 6 (2) edition, the journal still accept submission manuscripts written in Bahasa Indonesia. Notification upon the result of your the article submission and review may appear in the SPAM of your email. Please check your email regularly. Authors should use reference manager (for example Mendeley, Zotero, Endnote) to organize the references in the manuscript. 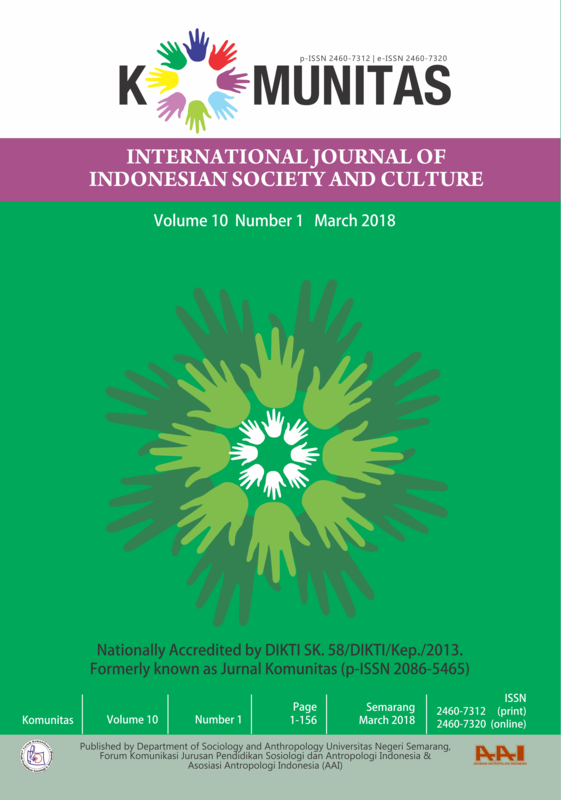 Komunitas: International Journal of Indonesian Society and Culture welcomes original articles on issues arising at the intersection of nations, states, civil societies, and global institutions and processes. The editors are particularly interested in manuscripts dealing with changing patterns in the analysis of ethnic groups, social classes, religions, personal networks, changes in mass culture, propaganda, technologies of communication and their social effects, and the impact of social transformations on the changing order of public and private life. The journal is interdisciplinary in orientation and international in scope, and is not tethered to particular theoretical or research traditions. The journal presents material of varying length, from research notes to article-length monographs. Published twice a year, Komunitas is a peer review journal. Already have a Username/Password for KOMUNITAS: INTERNATIONAL JOURNAL OF INDONESIAN SOCIETY AND CULTURE? First, article submissions should be research-based. Generally, the papers are composed of at the maximum of 9.000 words. (12) Does the manuscript discuss the social context of the research (e.g., size of classes, content of classes, type of institutions involved, any prerequisites, etc.)? JUDUL, IDENTITAS PENULIS, INSTITUSI DAN ALAMAT LENGKAP, ABSTRAK, PENDAHULUAN, METODE PENELITIAN, HASIL DAN PEMBAHASAN, SIMPULAN, DAFTAR PUSTAKA. Fourth, articles written in Bahasa Indonesia should be provided with English translation of the article. The abstracts are also written in two languages: Bahasa Indonesia and English. Fifth, KOMUNITAS: INTERNATIONAL JOURNAL OF INDONESIAN SOCIETY AND CULTURE encourages the manuscripts submitted should have journal articles in the references. Writers should read articles in KOMUNITAS: INTERNATIONAL JOURNAL OF INDONESIAN SOCIETY AND CULTURE for citation. • Glaser and Strauss (1969) discussed the importance…. • Merton (1940, 1945) argues…. • In the fi rst in-text citation of items with four or more names, use the fi rst author’s last name plus the words “et al.” List all names only when “et al.” would cause confusion. In citations with three or fewer authors, all authors’ last names should be listed the fi rst time the reference is cited. • When two authors in your reference list have the same last name, use identifying initial, as in in (J. Smith 1990). • ..issues that both faculty and students are expected to address (DeMartini 1983; Lynch and Smith 1985; Rippertoe 1977). Want to join KOMUNITAS: INTERNATIONAL JOURNAL OF INDONESIAN SOCIETY AND CULTURE Review Board? The journal is always seeking conscientious reviewers and extends an invitation to researchers to join the Review Board of KOMUNITAS: INTERNATIONAL JOURNAL OF INDONESIAN SOCIETY AND CULTURE.